Something recently got me thinking about Reinhold Marxhausen and how he helped teach me to see. Marxhausen was an artist and photographer who spent most of his professional life as a professor at Concordia College in Seward, Nebraska. In the mid-1970s I had the good fortune to take a brief evening class from him through a local community college. The official subject was photography, but the real subject was seeing. Lessons I learned in those few weeks still guide me more than 30 years later. 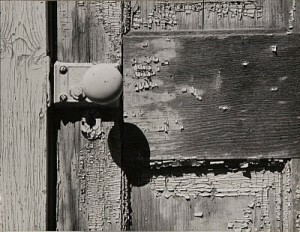 Marxhausen observed that a camera is an indifferent witness to the world. Human beings, to survive for millions of years have had to develop a way of seeing that instantly ranks the importance of objects and focuses on the most critical subjects in our field of vision. A prehistoric villager scanning the horizon for bears , tigers or bison can’t be distracted by every wildflower in the meadow. Modern men and women can’t be so focused on those wildflowers that they miss the stoplight in front of them. Thus, Marxhausen pointed out, the very skills that we hone in childhood and through every day of our life in order to function in the world are skills that we must un-learn or at least learn to turn off when we put a camera to our eye. To be a good artist or photographer requires that we see everything. We must remember that when reduced to a two dimensional frame, everything we be of equal weight unless we take a conscious step to create a hierarchy of importance in the image. Some photographers, Stephen Shore for example, play with the indifference of the lens, purposely flattening and juxtaposing objects to draw attention to things that our eyes would ordinarily filter out if we saw the same scene in three dimensions. Marxhausen loved seeing and loved the world he saw. His own artwork often captured the beauty of ordinary objects, so that it could be shared with others. Learning to truly see the world is a lifelong challenge. Reinhold Marxhausen helped show me the way and I continue to try to learn from his lessons. This entry was posted in On Photography, Photographers and tagged Art of Seeing, Concordia College, Reinhold Marxhausen, Seward Nebraska, Stephen Shore. Bookmark the permalink.